We have included an auction bid sheet sample to assist you in creating your very own. Providing your guests with the best tools at your silent auction is a critical step in executing a successful event. Silent auction bid sheets are a key component to a smooth, efficient bidding process and assist guests in bidding quickly and correctly. 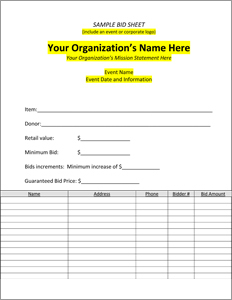 Creating a donation form for your silent auction shouldn’t be a difficult or time consuming task. These helpful tips can assist you in creating the proper bid sheets for your event. If you need advice or would like some professional assistance, call Charity Fundraising at (201) 492-4294. 1. Themed Bid Sheets: Keep your silent auction bid sheets themed with your other event materials and silent auction items. Make them attractive by including the colors and imagery of your event. Be sure to include your event tagline or logo if you have one. 2. Easy to Read Font: Remember that all of your guests do not have perfect eyesight and the lighting in the room may make it hard to read. Use large, easy to read fonts without shadowing and other formatting that may make text difficult to read. 3. Be Clear: List the time that bidding ends and begins and make sure that any instructions for bidding are clearly stated on the bid sheet. 4. Anonymous Is Best: Utilizing bid numbers instead of the bidder’s names will keep competition between bidders pleasant and anonymous. 5. Make It Safe: Always include a minimum bid and a guaranteed purchase price that will guide your bidders. As a general rule, the guaranteed purchase price should be approximately 150% of the value of the item. 6. Label Silent Auction Items: Be sure to label your charity auction items as well as the bid sheets in case they are moved, switched or lost. It is not uncommon for a guest to wander around the room with a bidding sheet in hand. If your organization is looking for silent auction ideas or items such as autographed memorabilia, VIP experiences and vacation packages to help you fundraise, contact Charity Fundraising today.